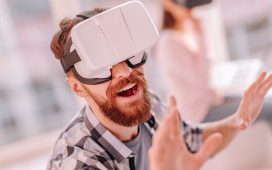 Understanding the different advantages AR, VR, and MR can bring to your business by understanding the fundamental differences among all three. Some people often confuse augmented reality with virtual reality and assume that the two terms are synonymous — or at least similar enough for the difference not to matter. They’re not, and it does. In fact, the only thing augmented reality, virtual reality, and mixed reality have in common is the ability to “warp” existing reality through digital means to create something new. Other than that, the specifics are vastly different. By now, you’ve probably heard about businesses using virtual reality and augmented reality applications and games to improve products, nurture buyer-consumer relationships, and increase sales. The technology works and — if used right — can be utilized for your company as well. The key is in knowing which technology is best for your business. But before you figure that out, you should at least know the difference between the three. As the name suggests, this technology simply “augments” or builds on what already exists. It places virtual elements — such as objects or people — in a real-world setting. The popular 2016 smartphone app, Pokemon Go, is an example of augmented reality. The app simply uses whatever the player’s smartphone camera captures, real-time, as the game’s background. It then places a 3D-rendered element (in this case, a Pokemon) on top to make it look as though the Pokemon is actually in this world. Based on a popular cartoon, this was one of the biggest selling points of Pokemon Go; the opportunity to bring these beloved creatures into the real world. With over 20 million daily active users globally, it is arguably one of the biggest augmented reality games to date. Given its nature, it is fair to say that virtual reality is far more, if not the most, immersive compared to augmented reality. Unlike augmented reality, virtual reality creates both the virtual elements and the digital environment. The end result is a brand-new artificial world for users to explore. To do this, a user will need a special VR headset. It typically covers the eyes (and sometimes ears) and is designed to project the virtual world as seen from a first-person point of view. This POV is actually used by many popular First-Person Shooter (FPS) games, such as the award-winning 2016 game, Overwatch. The headset is built to block out all real-world visuals to help the player further immerse themselves in the simulation. The player can then control where the camera points by moving their head around. Advanced VR technology goes a step further and allows the user complete freedom of movement. They can walk around the virtual world and interact with objects as easily as they would in the real world. Sometimes called “hybrid reality,” mixed reality is similar to augmented reality in the sense that it adds virtual objects to an existing real-world setting. The biggest difference is that MR technology anchors the object to the environment. Of the three, MR is the most recently developed. Given that it is characterized by synthetic virtual content accounting for and reacting to real-world content, it is also arguably the one furthest from fruition. Mixed reality can start with either the real world or the virtual world. In the first scenario, the user stays in the real world as virtual elements are added and anchored to the existing environment. The user can then fully interact with the elements as though they were physical objects. For instance; using MR technology, a person should be able to pick up a virtually-rendered ball in their real-world living room and bounce it normally. In the second scenario, a digital environment is rendered for the user to explore. While this seems like virtual reality, the objects that exist in the real world translate into and exist in the virtual world. Which of these three is best for your business? It all depends on how your business operates and what you’re actually looking to use the technology for. For instance, AR already has existing applications for retail and industrial companies. Online retailer Amazon offers an AR view in their app that allows customers to view how products would actually look in their home. This feature consequently aids their purchasing decision. Some businesses have implemented AR technology to create augmented reality games or add ‘lenses’ as part of their app features—think Snapchat or BeautyPlus. This effectively builds consumer-brand relationships, as people love playing around with their looks using 2D or cartoonish elements. Virtual reality and mixed reality, on the other hand, work better for behind-the-scenes business processes. For instance, production teams use VR or MR technology to create a product and test it before actually manufacturing it. Since they don’t have to build an actual physical prototype, this saves company time, effort, and resources. Mixed reality can be used to train new employees without compromising company resources as well. When given enough data, businesses can use VR technology to run sales simulations. If programmed correctly, the correlation between the artificial sales and physical store sales can be quite high, which leads to fairly accurate revenue predictions. Basically, all three technologies can be extremely useful for any business. It’s just a matter of choosing which one you stand to benefit from the most.